In this Sept. 16, 2018 file photo, Donald Glover, creator and star of the FX series "Atlanta," and a musician who performs under the name Childish Gambino, poses at a private cocktail party to celebrate the FX network's Emmy nominations in Los Angeles. The 55-minute movie seemingly came out of nowhere. In early April, Spotify began running ads for “Guava Island” and created a hidden playlist inspired by the film. Amazon Prime Video released a short teaser last week showing Glover and Rihannadancing in radiant beach outfits to drum beats. 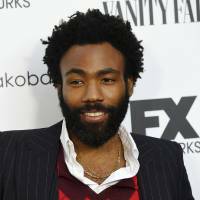 Then, Glover exclusively showed the film to Coachella-goers on Saturday as a part of his headlining set. For 18 hours, anyone could watch the movie for free on Amazon Prime Video, but now only subscribers can view it.